The Internet Chess Club is excited to announce its new monthly tournament with cash prizes. 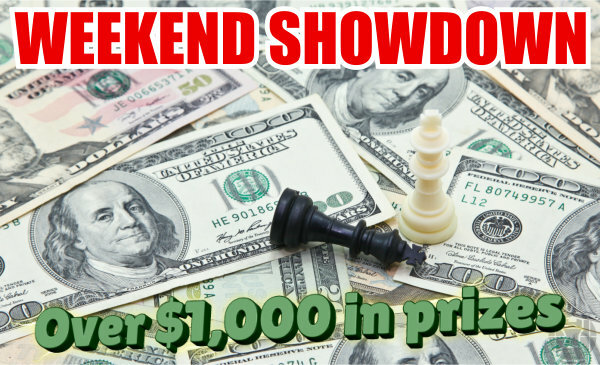 To be played on the first Saturday of each month, November Weekend Showdown cash prize tournament was held November 3, at 2:00 PM (EDT) - BLITZ 3 0 NINE ROUNDS - Thematic, with a new initial position for each round. We offer cash prizes for the top finishers, as well as ICC membership time and video series giveaways for class winners! The ICC WEEKEND SHOWDOWNS is an occasion to measure your strength against super-strong players and, why not, to win one of many fantastic prizes!